Styled with mia pant and ganna jacket . 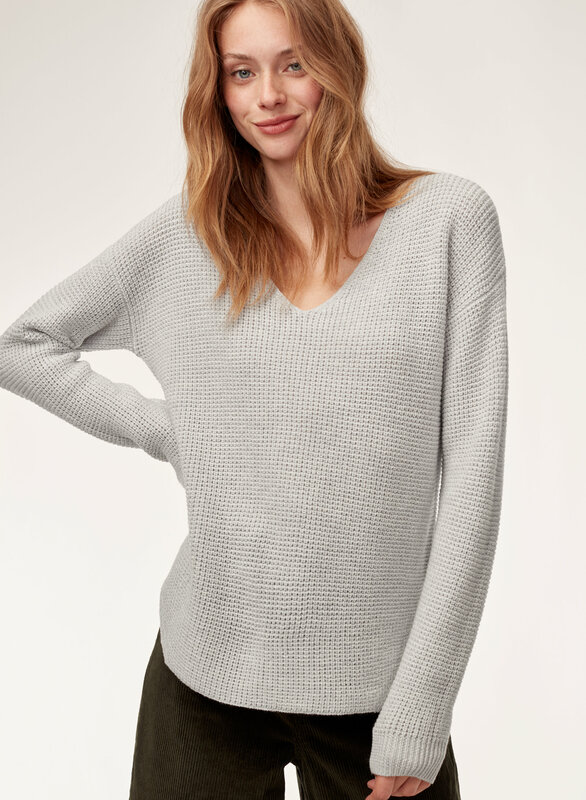 Knit with soft Italian merino wool, this Wilfred Free staple is effortless and cozy — with a textural waffle stitch and feminine neckline to keep things interesting. Better yet: we've updated the fit to make it even more flattering. 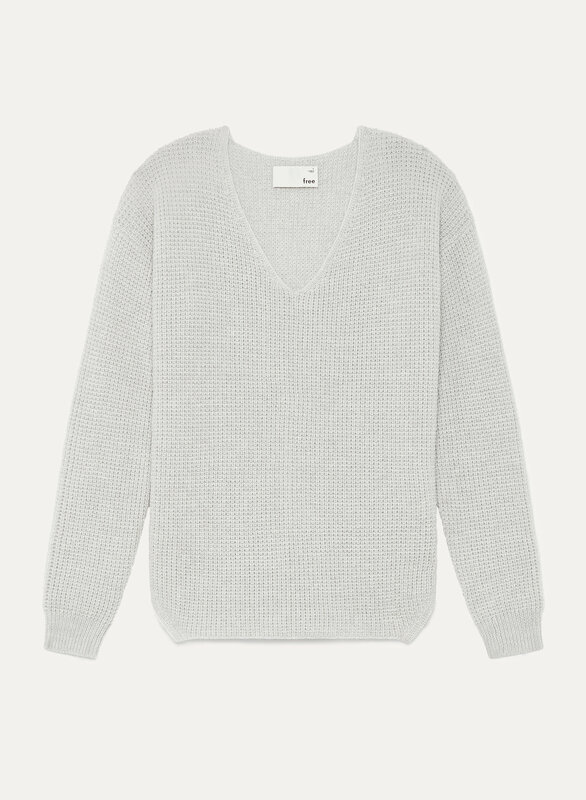 This is a basic sweater but still stylish on its own. I love the colour and the weave. I wish it was more washable but wool is delicate. It is a great weight too. This jumper is lovely! It pairs well with skirts + dresses just as well as it pairs with denim. The beige color is versatile as it can be worn casually or dressed up. I love this! I have this sweater in 2 colors. It's effortless to wear. Fits it all the right places plus it's comfy. The v neck is nice but isn't too deep. I loved this sweater when it came - the fit and shape were great, it was not acrylic, I thought it would be my staple black sweater. After 1 wear, then washed exactly according to instructions it looks awful! It's pilling, snagging, the waffle pattern is all blurred - it looks like it is years old. I'm so disappointed in the quality of this sweater. Been eyeing on this for years and finally got one. Love it! Unless you indent to dry clean this sweater, don't waste your money. It's comfortable and soft, but even hand washing in cold water the sweater shrinks... everywhere! The weave shrinks in length, width and sleeves, and stretching it doesn't return it to its original shape and size. The softness is also lessened when washed as the weave tightens. It was once baggy and loose, but now quite fitted, and I bought a size larger than anticipated. Sweater was beautiful soft material and a lovely colour but followed instructions to hand wash and reshape it but it didn’t go back to original size very disappointing. This is such an amazing sweater. Got numerous compliments. It’s very cozy. Falls nicely and like the style but a little bulkier than I anticipated. 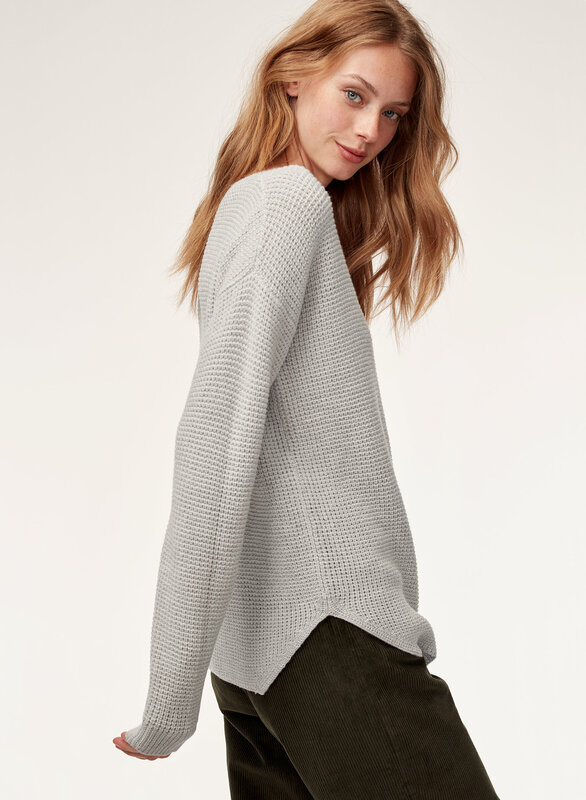 Very soft sweater, flattering fit too. Do consider a size down, it will stretch once you wash it (carefully by hand in cold water). I love the design and the fit but if I’m beeing honest, it’s not worth the price but I still love it. nice sweater but I'm finding the fabric starting to look worn only after a few times wearing it. I haven't washed it so it's starting to "pill" just from wearing it. Very comfy, breathable, yet warm! It's not itchy and it looks flattering alone or under a coat. I have 5 of these in different colors. It's a must-have Fall/Winter staple! I got it in black and I've already work in three times. It's such an easy piece and it works with anything. The material is soft and draps beautifully. I love the colour too. I’m happy with this purchase. Very flattering. Great style for all ages. Vneck is just right. Runs big. I like the color and the size of the knit. 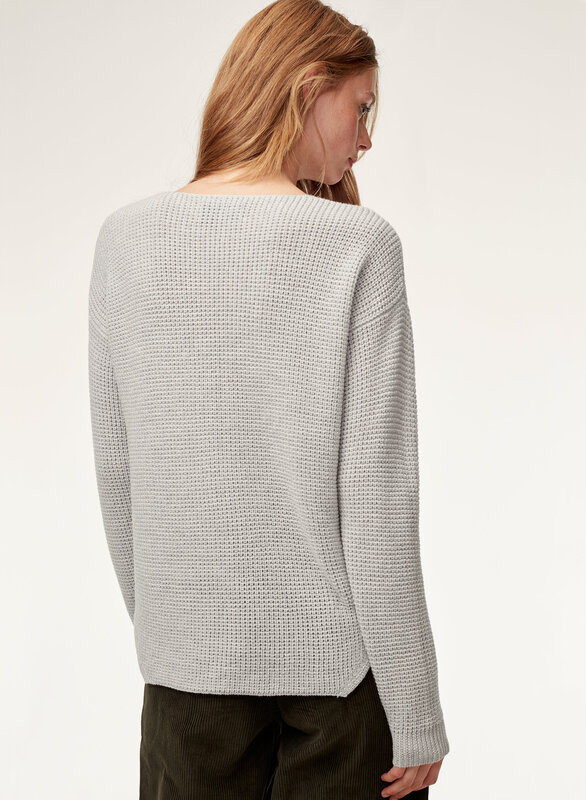 Love it, it is the perfect casual sweater. My new favorite sweater of the season! So comfortable, great quality and fit! Sleeves run long which I love but if you are between sizes, I'd suggest going the size down.